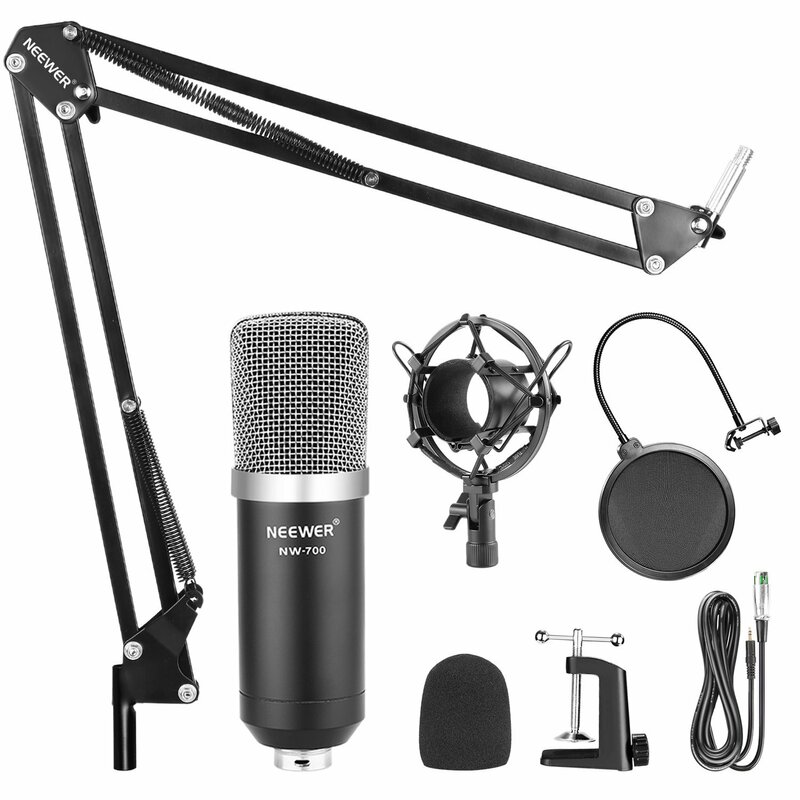 The Neewer NW-700 microphone bundle is jam packed full of accessories to go along with the microphone but that's where it stops. It is simply a glorified microphone accessory bundle and that is it. The fact that it comes with a microphone is barely worth mentioning. I know that should be the main thing you are buying but really I would look at this bundle more as a microphone accessories bundle that happens to includes a microphone. I am sure you are starting to get the picture now that this mic is nothing to get excited about. Oh God where do I begin. First of all if you happen to get lucky and receive one that actually works you will immediately realize that it does have a little bit of weight to it making you kind of get the impression that it might be built with a little bit of quality. Don't get me wrong they do look nice and have great aesthetics about them but that's all they have going for them. They are slightly lighter than let's say a good mid range affordable mic like an Audio-Technica AT2020, click here to see my full review of the mic. If you're coming from a microphone of substantial quality this will surely be a letdown for you unless you just need it for casual conversation and talking on the phone. I do believe if you were going to use it for any audio recording such as recording music with vocal tracks you will be let down if you've had a nicer mic before. If you have never had a quality microphone than you will not really be able to tell a difference. You will think it is built with great quality from compared to less say your headphone microphone to your iPhone or Android phone. Some users have reported hearing a buzzing sound during used in recording but I did not hear this in mine. I will say it has a very lighter sound and doesn't have a hefty robust sound like $100 condenser mic should. But like I said if you need it for light use this would be an acceptable microphone. Especially considering the fact that it comes with so many accessories. Bottom line is this this is a very cheaply made microphone from China that is hit or miss on the quality of assembly and parts. There is a 50-50 chance that you may get a non-working unit fresh out of the box that is brand new. If you absolutely need something to record your vocal tracks with and you are not worried about extremely high-quality this can get you by as long as you are using a proper DAW system to record with. The ideal scenario for this microphone I believe would be phone calls video conferencing and light note-taking through your desktop or laptop computer. I recommend getting this product if you are extremely low on money and you are not extremely worried about the highest of quality. I would also buy this unit alone just for the accessories because if you go to Amazon and add up the price of each accessory individually you will not be able to come close on the price comparison if you create your own bundle to buy on Amazon. In a complicated answer as to would I buy this again, I would not buy this again if you are relying on it for recording I would buy this again if you needed every accessory that this package comes with. What you could do is order this package use the accessories and the microphone as a backup mic, plan on getting yourself at least a little bit nicer condenser microphone in the $50 range if you are tight on budget. If not, focus on getting a $100 condenser microphone like the Audio-Technica I mentioned, you can’t go wrong with it. On a side note for something to mention you may see this package on Amazon in a variety of styles and looks as far as the color of the accessories and microphone and they may even have a different brand name but the bundle will still look pretty much the exact same. I would not get any of these and all these are are the same exact components being purchased by different companies,they simple modify the look so their brand looks like they have a different model. Trust me they are all the exact same inside. This package is being sold as what they call a “White Label” item, which means different brands purchase this bundle and modify the colors or shape a little bit and slap their name on it as a different product from their competitors and compete only with price. All you need to keep in mind is that every bundle that has the same exact accessories will be of the same exact quality. I hope this review helped and if you have any questions or comments please feel free to mention them below.